(NaturalNews) When will the government of the United States of America ever actually help Americans get healthy, and duly inform consumers about all food ingredients by utilizing honest food labels instead of using trickery and deception? Every year, the FDA and the USDA approve more and more food toxins, while covering up the health detriment they cause, all while leading people down a dark corridor of poor health. Does it really matter if you "count calories" if all those calories are empty ones, devoid of all nutrition? Will it be helpful to limit or eliminate your "fat" intake, if you only limit or eliminate all the good fats – the kind your body needs to function properly? Did your MD bother to educate you about the difference between good fats and molecularly-altered "bad" fats? Labels were first focused on how much fat you eat, but since the FDA doesn't educate anyone on bad fat versus good fat, it never mattered. What if you get excited about some new labels on food because you're supposed to watch your cholesterol, only to find out that you need cholesterol and your medical doctor and the labels steered you completely wrong? And then there's sugar – the sugar that comes from genetically modified corn, highly concentrated (HFCS) which contains bug-killer and weed-killer that leads directly to cancer and diabetes. What difference does it really make if you "moderate" your poison intake? It's still poison. Will you brag to your friends that you're regulating and "reducing" your own poison intake because some new food labels are helping you? The FDA is actually announcing that serving sizes will be "less misleading." How about not misleading at all? What if someone told you they would be less abusive to you – would you be excited about that? The size of the "calories" number will be much bigger and bolder. Now we are to "count calories" more easily, as if it matters whether you eat the whole can of toxic chili or half, or whether you eat six donuts or four, or you chomp down half the sack of hydrogenated-GM-oil-soaked chips or the whole bag. Labels will give a new "percent daily value" for sugars, letting you know how much sugar is recommended for your "daily intake." This is supposed to influence food manufacturers to put in less sugar at the factory. Does that mean they will simply insert more of those deadly chemical sweeteners in order to compensate for America's sweet tooth, like aspartame, sucralose, sorbitol, saccharine and acesulfame potassium? Basically each whole package of food will be a serving, so obese people feel less obese, and diabetics may feel less diabetic. No more guilt for eating that party-size bag of chips. That's just one serving! Wait, you ate a whole box of cookies and drank a half-gallon of conventional milk? No problem. That was just a single serving. The FDA is saying that, by law, serving sizes should be based on actual consumption habits and not ideal consumption, and since more than a third of Americans are obese, and half of the rest are overweight, that "Big Gulp" at 7/11 will become one serving. Are two double cheeseburgers and some super-sized fries just one helping? What's next, a two-liter bottle of diet soda becoming one serving? Hey, look, no calories! Most food companies are being given until July of 2018 to comply, or face government intervention. Smaller companies may get an extra year to comply. Michele Obama is leading the charge for these "new labels," but her husband is the King of GMO and does whatever Monsanto tells him to do. These new food labels don't "inform" us of anything, they misinform us on everything. What's hiding in U.S. foods are thousands of chemical agents approved by the FDA, genetically modified organisms that were never intended to be eaten, and chemical cleansing and preserving agents that lengthen food shelf-life while shortening human life. As Americans become more obese and more diabetic, fewer and fewer consumers are reading labels or even know what they're reading if they do. It's a tricky, corporate world of smoke and mirrors out there, and the only healthy Americans are ones who educate themselves about dangerous food ingredients and look to alternative health news for answers. 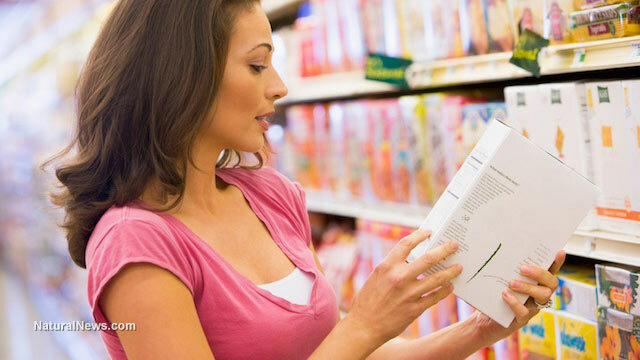 Want to learn how to read food labels and filter the disease-promoting ingredients? Stay tuned for the upcoming Health Ranger book that teaches you how to quickly and properly decode the labels and ingredients on not just food, but supplements, personal care products and medicines. There are new helpful rules for reading labels, but they're not coming from the U.S. government or the U.S. regulatory agencies. Watch this space.